What specific, measurable changes do you want to occur? Valley Food & Farm (VF&F) had a challenge: How can we help farmers and food producers in the Upper Connecticut River Valley of Vermont and Hampshire sell more products at farmers markets, farm stands, and CSAs? So VF&F hired Good Egg and Sirius to create a campaign strategy, slogan, and materials designed to motivate Upper Valley residents to buy direct from farmers more frequently. At the end of 18 months, VF&F will measure if Upper Valley farmers have increased revenue from these direct sales venues. 2) Choose your target audience(s). WHO must do WHAT for you to be able to achieve your goal? Theoretically, Valley Food & Farm’s audience for their campaign could include everyone who lives in the Upper Valley. Rather than make a generic appeal to everyone in the region, however, Valley Food & Farm wanted to target specific types of residents that they felt could be persuaded to shop at farmers markets, farm stands and CSA more frequently. Based on research, we agreed to focus on families with school-aged children and men who like to cook. We knew that parents with young children are likely to be motivated by opportunities for family outings, especially outdoors, and many “men who cook” enjoy grilling meat and entertaining. We drafted a set of possible campaign slogans and “ads” designed to appeal to these two target audiences. Does your target audience respond the way you want them to respond? Although we were working on an extremely tight budget and timeline, we made sure to schedule time to test responses to our initial concepts before working out the actual designs. Valley Food & Farm recruited focus group participants for each of the target audiences, Good Egg wrote focus group scripts, and Sirius created very basic mock-ups using stock photography to show the concepts to the participants. Some of the feedback from focus groups had more to do with the stock photos and rough layouts we used than the concepts themselves, but we were still able to get valuable input that helped us shape our final creative direction. In particular, they wanted to know where to buy local food directly and how to cook it. They liked the idea of being able to go online for a directory of where to find local food in their area. And they wanted photos of real people who lived in the region whom they were likely to run into at the farmers market. Does your target audience know what you want them to do?? We returned to brainstorm mode. How could we create a fresh look and messages that would appeal to multiple audiences in a variety of settings? We wanted the name to be a “Call to Action,” so we needed a verb. But instead of one verb (“Get Valley Farm Fresh”), we thought that multiple verbs would make the message even stronger: Get Valley Farm Fresh. Eat Valley Farm Fresh. Grill Valley Farm Fresh. Live Valley Farm Fresh. And so on. The campaign slogan was now a headline. Suddenly, the ads started looking fresh and inviting. 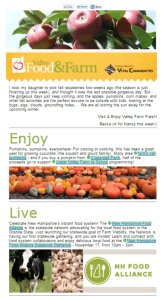 Sample newsletter from the Valley Farm Fresh campaign. Adjust your strategy as you implement your campaign. We incorporated the design and calls to action throughout the campaign, from the website, emails, and a #ValleyFarmFresh hashtag to print ads, flyers, and rack cards. 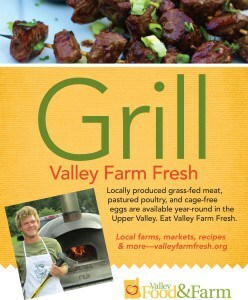 We also developed a marketing and outreach strategy that will be integrated with all of Valley Food & Farm’s activities. While ads and events are important, sometimes the most effective way to reach people in the two targeted groups may be through personal contact. The campaign strategy includes outreach to specific organizations and people who can help us connect with families with school-aged children and men who cook. VF&F launched the campaign in July. “People love the materials,” says Valley Food & Farm Manager, Becka Warren. “But we’re still getting everything under our belts.” Reaching the two new audiences is VF&F’s highest priority. “We’re promoting Winter Farmers Markets to families with school-aged children in December, and we’ll use a Valentine’s Day initiative to appeal to men who cook,” Warren adds. Warren is doing what all good campaign managers do: she’s making it work. A successful campaign requires more than a set of key messages and beautiful artwork. No matter how much research and testing you do in advance, you don’t know what will work until it’s out in the field. A good strategy and creative approach should be adaptable to meet a variety of needs. That’s the excitement—and challenge—of creating a successful campaign.